It’s never too early to start thinking about how to fund your passion. We are going to share three ways to do it! Last time, we continued our conversation about Hollywood’s dirty little secret. 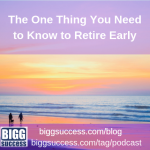 We discussed what to do if you can’t do what you love. Today, on The BIGG Success Show, we continued the conversation even further. 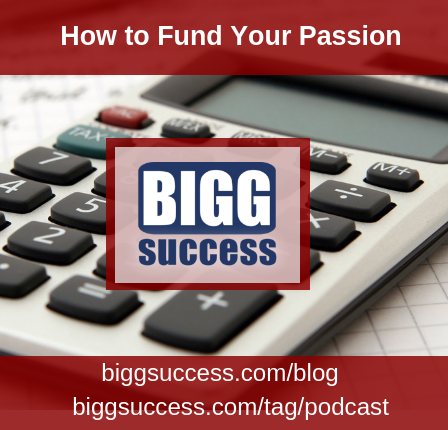 We talked about how to fund your passion. Here’s a summary of that discussion. This series of shows was inspired by the story of Geoffrey Owens, best known as the son-in-law on The Cosby Show. He was seen bagging groceries at a Trader Joe’s. It seems a lot of people these days feel better about themselves by mocking others. But, he argued, working at Trader Joe’s helped him pay the bills while he continued to do what he loves to do: acting and teaching. The good news is…good prevailed – he got an acting gig. So now he can follow his passion full-time. But his story inspired us to think about how to fund your passion. We call this option the “prelude to passion.” You save now with a very clear “why” – to fund your passion down the road. The greater the gap between what you make and what you spend, the faster you can follow your passion. You can continue the status quo, or you can purge expenses so you can save more. You may become an extreme saver, so you can follow your passion sooner. You may also bank all of your pay raises and bonuses. Any increase in cash inflows can be used to bump up your savings, so you can pursue your dream earlier. We call this the “passion promoter” because it speeds up the time before you get to pursue your passion. Ideally, you combine it with the prelude to passion mentioned above to really decrease your runway to following your passion. Note that your side hustle in this case may not be your passion. It is still helpful to your cause because it provides needed resources to move you closer to being able to do what you love. We label this option “passion plus” because it calls for following your passion now and funding it with a part- or even full-time side hustle. Many aspiring business owners feel that other people will see this as a failure. First of all, who cares what other people think. All you have to do is succeed and then see what they think! Secondly, if your passion is truly important to you, you will do anything and everything, legally and ethically acceptable, in your power to continue to do what you love to do. If this means a reverse side hustle, while you build your business, so be it. It takes a “do what it takes” attitude to reach BIGG success! or the opportunity to follow your passion may pass you by. If you are doing what you love, share your wisdom. How did you fund it?